2019 Best Industrial Engineering Colleges in the U.S.
Because only 5,390 students graduate with a degree in Industrial Engineering each year, it ranks only 76th out of 384 in size. Industrial Engineering graduates on average make $56,751 in their early career salary and $92,163 in their mid-career salary. This is 28.0% greater than the typical college graduate. In fact, Industrial Engineering ranks 15 out of 121 majors analyzed when it comes to projected income. Below you'll see a list of the best colleges and universities to study Industrial Engineering. Our ranking methodology takes into account education quality, average earnings of graduates, accreditation, and several other relevant factors. Georgia Institute of Technology - Main Campus is the optimum choice if you are considering majoring in Industrial Engineering. With 403 students enrolled, ie is one of most popular majors at Georgia Institute of Technology - Main Campus. The setting in a large urban center is great for young people seeking ample choices for networking, excitement, and exploration. University of Michigan - Ann Arbor is among your best bets if you're planning on studying Industrial Engineering. Students from the industrial engineering major at University of Michigan - Ann Arbor get 1.8% above the average graduate with the same degree. With over 20,000 undergraduates, University of Michigan - Ann Arbor is among the biggest schools in the U.S..
Every student pursuing a degree in Industrial Engineering needs to look into Virginia Tech. Virginia Tech industrial engineering students make 10.0% more than the typical ie student. With more than 20,000 students, this institution is one of the largest schools in the nation. First-year students are not required to live on-campus at Virginia Tech. Sports lovers will like watching the school's top-ranked women's soccer team as they play at home and on the road. Videos from Virginia Tech could be a great way to get more info on the school. It is difficult to beat Purdue University - Main Campus if you want to pursue Industrial Engineering as a major. Ie graduates from Purdue University - Main Campus get a earnings boost of around 1.3% above the typical income of industrial engineering graduates. The setting in a large urban center is tremendous for scholars trying to find adequate choices for social networking, excitement, and life. Purdue has earned a top rating for education quality for veterans and active-duty military. Given that 22.4% of Purdue's student population originates from outside the United States, you are going to have many chances to befriend students many areas in the globe. 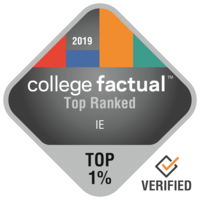 Take a look at every one of Purdue University - Main Campus' rankings to know more about the college. It's difficult to beat Lehigh University if you wish to study Industrial Engineering. Graduates from the industrial engineering major at Lehigh University get 23.6% more than the standard graduate in this field. Bethlehem, Pennsylvania is an ideal surrounding for individuals who appreciate the fast-paced city life. Lehigh University attracts the best of the best, and the average SAT score of applicants is typically around 1,325. At least 82.0% of the instructors at Lehigh have full-time hours, so they have ample time to give attention to their students. Take a virtual tour to learn more about Lehigh's campus. Texas A&M University - College Station is a good decision for students pursuing an Industrial Engineering degree. In addition to its bachelor's programs, Texas A&M University - College Station offers graduate degrees in IE. Situated in College Station, Texas, this college is ideal for students who prosper in a city atmosphere. Texas A&M features a high performing women's soccer team. You'll be able to learn about numerous nationalities because of Texas A&M's diverse population. Watch some school videos to learn more about what's happening on campus. Any student pursuing a degree in Industrial Engineering needs to check out University of Southern California. In addition to its bachelor's programs, University of Southern California offers graduate degrees in IE. University of Southern California is one of the largest schools in California. Rensselaer Polytechnic Institute is among your top options if you want to study Industrial Engineering. Students who graduate from the ie program earn an average of $62,431 in their early career salary and $100,292 in their mid-career salary. Placed in Troy, New York, this school is a sound choice for students who enjoy the thrills of a substantial city. Students from outside the U.S. need not be worried about sticking out mainly because 12.0% of RPI's students originate from countries outside the U.S.. Students shouldn't let affordability concerns prevent them from deciding on Rensselaer Polytechnic Institute as 88.0% of students get some sort of financial aid. Get an idea of what student life at RPI is like by enjoying some campus videos. It's hard to find a better school than Northwestern University if you wish to study Industrial Engineering. In addition to its bachelor's programs, Northwestern University offers graduate degrees in IE. Northwestern University has one of the largest student bodies in Illinois. Any student who is interested in Industrial Engineering needs to check out Clemson University. Clemson University offers graduate degrees in ie for those interested in an advanced degree. Clemson University is among the largest schools in South Carolina. Considering the fact that 7.0% of student loan borrowers have defaulted, Clemson's default rate of 3.2% is really good. About 72.0% of undergraduates receive some type of financial assistance at Clemson University. Get a better idea of what student life at Clemson is like by viewing some campus videos.